Students of PGDM, Batch 2017-19 made a visit to Moon Beverages on 8th and 9th December 2017. During the registration process, students were offered a variety of Coca Cola beverages followed by sharing the video clip Journey of Coca Cola over the years. 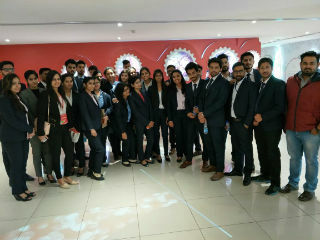 Students then headed towards the Heritage Lobby where they were enlightened on the changing trends of both bottle design and advertisements of Coca Cola, and the reasons for each alteration and modification. Students, then took a tour of Production Area where the authorities in-charge explained the various processes and methods of production and packaging of the COCA product. Students looked upon different machines to achieve the desired target for the day. A different flavour is produced each day. However, the formula is still kept a secret to intact the USP of the brand. The manufacturing process seemed quite fast and capital intensive. Since, the company is also associated with Coke Studio, students even got a chance to listen to a few of the songs from their corresponding albums. •VEER- to help the physically impaired get jobs. •UNNATI- a mission to help farmers to get better quality of output. •RECYCLE AND REUSE- trying to minimise the water usage at the time of cleaning the bottles by means of steam. 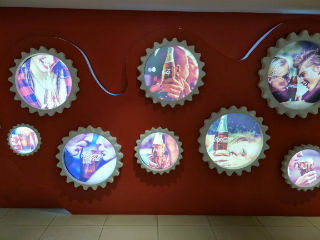 •COKE STUDIO- to encourage young and raw talent in the field of Entertainment industry. Students got a chance to explore the Polar Bear-Selfie Corner (major attraction) for group pictures. It was a great experience.